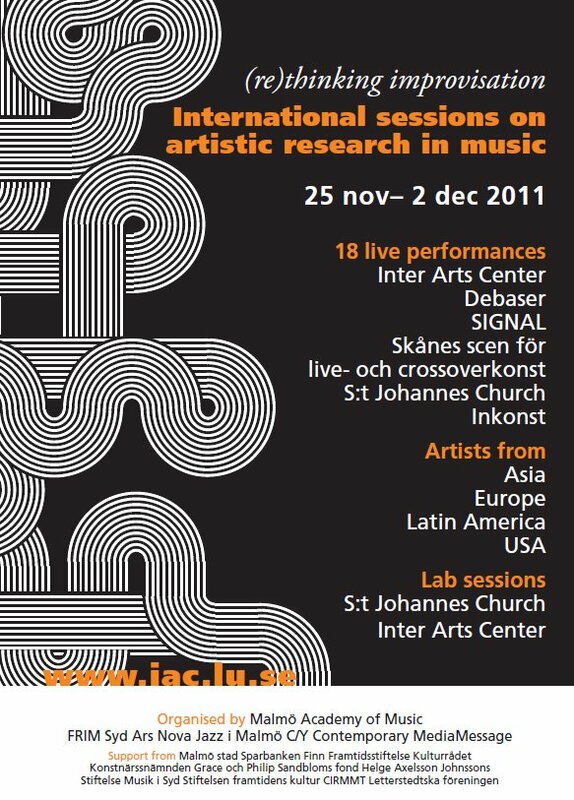 The international sessions for artistic research, which is a festival and symposium for improvised musics of many kinds is starting tomorrow Sunday November 27. A flyer with a condensed program can be downloaded here. Centered around the concept of the lab as a venue for a review of artistic work as process, the ambition is to merge various kinds of knowledge production in the arts with various analytical modes of thinking. Each member of the research project will direct sessions to which a wide range of artists and scholars will be invited to contribute in the form of performances, art works, papers, lecture recitals and any other format that is pertinent to the argument one wants to make. These lab sessions are the core of the event. 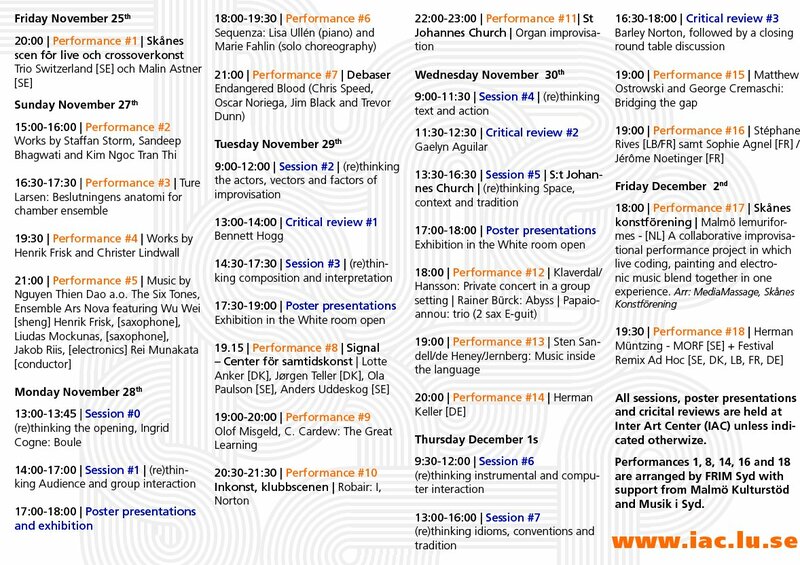 However, (Re)thinking Improvisation also hosts a series of public concerts in and around Malmö. There will be no parallel sessions so all participants can take part in all labs and, furthermore, each day invited artists/scholars will sum up and critically review the sessions that have taken place. Our ambition is to create a format for discussion and dissemination of artistic work and thinking about and through artistic work, while avoiding the all too common theory/practice dichotomies and allow for a creative and intellectually vital environment in which artistic and scholarly approaches to the topic of improvisation can be molded together. The sessions will primarily take place in the facilities of the Inter Arts Center which affords flexible and technically well equipped venues for both music and visual arts. In addition, some of the sessions and many of the public concerts will be scheduled in other venues that are particularly suited for the content of the event.